Save up to 5% with a 24-hour Barcelona hop-on, hop-off tour and Sagrada Familia skip-the-line entry! No need to print a ticket for your Sagrada Familia audio-guided tour! Frequency: Every 10 - 25 minutes depending on the season. Complete Loop: 2 hours approx. Red & Blue line/route takes around 120 minutes and Green line/route takes around 40 minutes. Barcelona Hop-On, Hop-Off Tour: You can board the bus from any of the bus stops; show your voucher directly to the bus driver. Cruise passengers: This tour can easily be taken if arriving in Barcelona by cruise ship. A shuttle service is provided from the port which takes cruise guests to the two closest tour stops, World Trade Center (Stop 15) and Museo Maritim (Stop 16). Visit the information desk at the Cruise Port Terminal to know the directions for the shuttle services specifically. Barcelona Hop-On, Hop-Off Tour: Hop off the bus at any of the stops. Sagrada Familia Skip-the-Line Access: Same as the start point. Experience the best of Barcelona and enjoy savings of up to 5% with an action-packed Barcelona hop-on, hop-off tour and priority access to Sagrada Familia: Barcelona’s most famous attraction! Explore Barcelona on a hop-on, hop-off tour and customize your own sightseeing itinerary. Discover the city from open-topped buses, enjoy audio commentary and visit attractions of your choice. Visit the beautiful la Sagrada Família, Antoni Gaudi’s unfinished masterpiece. Enjoy stunning views of Barcelona from either the Passion facade or the Nativity facade of Sagrada Familia and enjoy panoramic views of Barcelona on an audio-guided tour. Use the guide map available on this tour to make your own itinerary and travel the city at your own pace. Also enjoy discounts at many locations and different outlets around the city. Learn about the places to visit through the on board audio system available in 10 languages. Make your own way to the beautiful la Sagrada Família, Gaudi’s 144-year-old unfinished masterpiece which is estimated to finish by 2026. You can continue sightseeing on your own after your Sagrada Familia visit. 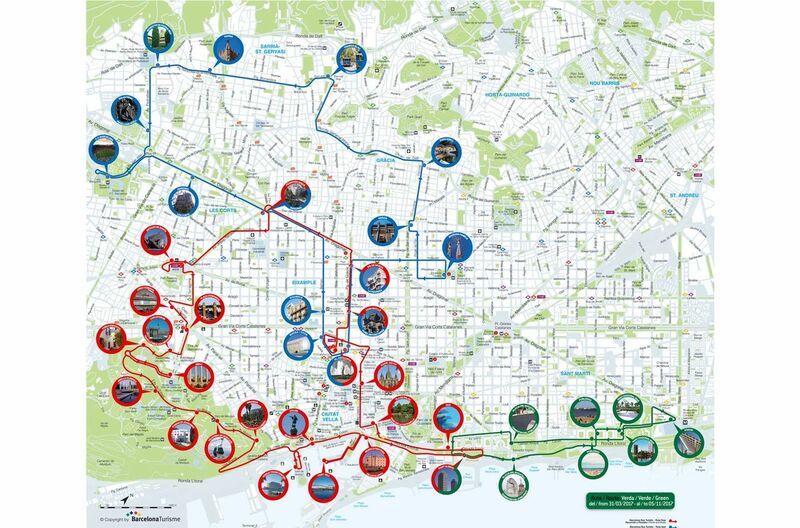 City Sightseeing Barcelona has introduced new fleet of buses for Barcelona Turistic bus tour. The City Sightseeing logo is on the front of the bus located at the top. The new buses are in shades of pink and blue. Buses are equipped with motorised ramps. for wheelchair access to the lower deck. Wheelchairs cannot be collapsed and stored. Passengers would have to take steps to reach the upper deck. Green Route which is a seasonal route will run until 4 Nov 18. It is only the Red and Blue Lines that operate all year round. The organisation reserves the right to modify or limit the public sections of the basilica for reasons of safety, restoration, maintenance, adverse weather conditions or one-off events. This does not give ticketholders the right to any discount or refund on the price of the ticket. No refund after making reservation. Audio guides are not available for children under 12 years old. Brilliant way to see Barcelona on the hop on hop off bus. Fast track tickets are essential if you don't want to waste your holiday time in queues. Saved money and printed my tickets at home. Combo ticket is a good deal! Great deal when we bought the two passes together.